Cabot demolishes home central to Dimock water dispute, Methane problems persist in 9-square mile no-drilling zone | Stand With Dimock! Cabot Oil & Gas executives may have ongoing problems with operations in Dimock Pennsylvania, but the status of water quality at 1101 Carter Road is no longer one of them. After years of controversy, Cabot last year paid an undisclosed amount to owners of that property, Craig and Julie Sautner, to settle claims that drilling contaminated their water well. As part of the deal, Cabot acquired the 3.6-acre property, the status of which remained a matter of speculation until last week when flatbeds unloaded a demolition excavator and multiple dumpsters in the driveway of the vacant home. The arrival of the demolition crew marked a concluding chapter of a conflict that began in September, 2008, when the Sautner’s water suddenly went bad after Cabot crews drilled a nearby gas well into the Marcellus Shale. Under oversight by the Pennsylvania Department of Environmental Protection, Cabot attempted to restore the Sautner’s water with a system of filters and tanks, which took up a substantial part of the basement. The system proved ineffective, and the company began delivering bottled water to the house. Since then, the three bedroom ranch, sitting tidy and plumb under a canopy of maple trees off the bucolic dirt road, has become a symbol of the anti-fracking movement in the heart of Cabot’s most prolific well field. As drilling intensified in the area, Cabot began dealing with similar water complaints at dozens of other homes in the Carter Road area. After investigating the complaints, the DEP held Cabot drilling operations into the Marcellus Shale responsible for methane contamination in 18 water wells, and eventually ordered the company to install an $11 million pipeline to deliver water to the homes. Cabot resisted, and the DEP’s order caused a political fracas that split the community. A group of residents, including those receiving royalty payments and other compensation from the company, sided with the industry and characterized those demanding the water line as malcontents. Plans for the water line were dropped after Tom Corbett, a gas drilling proponent, was elected governor in 2010. But the DEP continued to enforce a ban on drilling in a 9-square mile area around Carter Road where problems persisted. The primary constituents affecting the wells – methane, arsenic, barium and other metals -- are naturally occurring, and also a product of drilling. My coverage of this story for the Press & Sun-Bulletin, and later in writing Under the Surface and posts for this blog, brought me into the Saunter’s home on several occasions. The house, with three bathrooms and a finished basement, was fairly new and well kept. A barn-star adorned unblemished vinyl siding next to the garage entrance, and America the Beautiful was inscribed in a silvery stencil on the wall opposite the entrance in the main foyer. The interior decor reflected the Sautner’s fondness for wall art and country nick knacks, carefully arranged, along with framed photos of the Sautner’s teenage children – Cody and Kelly -- and their various pets, including Emmi, an overprotective Chihuahua that had to be contained when visitors arrived. The federal agency began it’s own series of tests, and found arsenic, barium, manganese, chromium, and methane in five of 61 wells at levels “that could propose a health concern.” The agency determined no follow up was necessary, however, because residents of affected homes had been notified and polluted wells were taken off line or equipped with filters. The contamination -- in roughly 8 percent of the wells tested -- was from naturally occurring compounds that are also used in or associated with drilling operations, which can exacerbate existing problems or introduce new ones. Frustrated that Cabot avoided accountability for the problem, the Sautners emerged as dedicated and nationally visible critics of the industry with a degree of animosity that grew with each passing year. 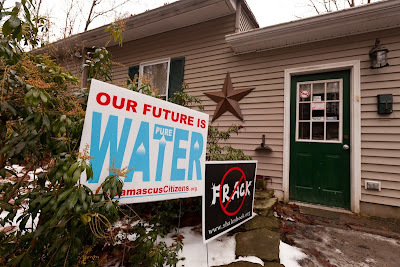 They filled their yard and garden with anti-fracking posters, and jugs of brown water. They appeared on television and radio shows and were featured at anti-fracking rallies and concerts, typically carrying the water jugs that became something of a trademark of the movement. Notably, the Sautner’s story was featured in Gasland, the Emmy-award winning film by Josh Fox that premiered on HBO in 2010, and which was largely responsible for inspiring the anti-fracking movement. The story is complicated by water quality tests that show different things at different times to different parties, and a settlement with Cabot that forbids parties to talk about the case. 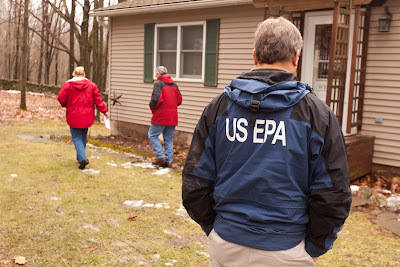 We know that, while the Sautner home apparently passed spec when the EPA took samples in January, 2012, it had a documented history of pollution prior to that. 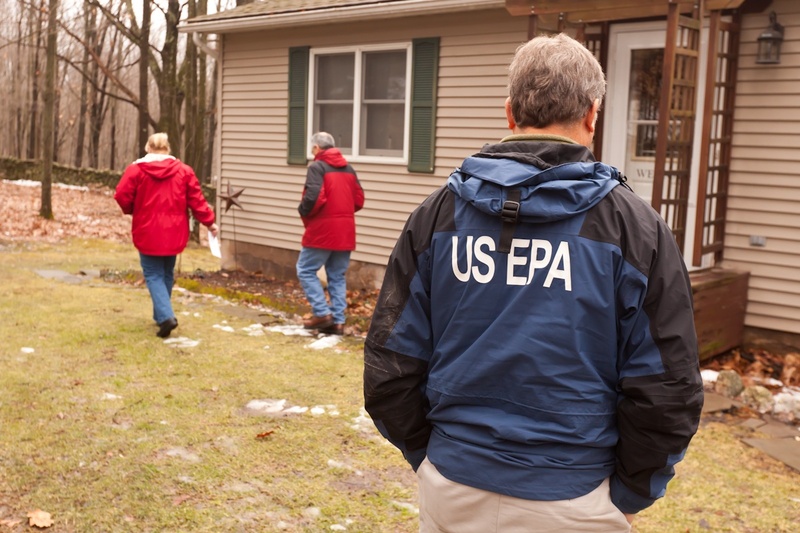 We also know that the EPA confirmed water problems at five homes. And we know that, in addition to whatever other terms the Sautners settled with Cabot, they received $167,500 for their property; and it struck me as newsworthy when I heard that contractors working for Cabot had arrived last week to demolish the home. I placed a call to Cabot spokesman George Stark, who told me that the company had a potential buyer for the land and that it was more marketable without the house. Stark said he did not know if the land would be developed, and could not offer other details. An obvious line of thinking, reflected on anti-fracking list serves, is this: With no home, there is no well, and with no well, there is no liability related to water pollution, at least at 1101 Carter Road. But water pollution at other homes continues to plague the company. Regulators are now focusing on methane pollution in three water wells about a mile south of the Sautner home, where Carter Road tees into State Route 3023. The DEP has indentified Cabot’s Costello gas well at this location as the primary suspect. Stark said that a service rig, which has been at the site for months, allows crews to “monitor” the casing of the gas well, which appears sound. DEP officials explained it differently. They have not pinpointed a source, according to a recent report in the Scranton Times Tribune quoting DEP spokeswoman Colleen Connolly. But they have determined that the suspect gas well is "unviable" and will have to be plugged. In an email response to my query, Connolly reported that Cabot is ”continuing remedial efforts” at the Costello gas well and “evaluating the effectiveness” of the work. Methane levels are fluctuating, she said. Additionally, tests have shown levels of iron and manganese that were elevated but within standards in some water samples. Elevated levels of these elements is “not uncommon during gas migration,” she reported. New and substantial research shows that methane migration from shale gas development is not an isolated problem. A recent study published by the Proceedings of the National Academy of Sciences shows that methane concentrations to be, on average, six times higher for homes with water supplies a kilometer or less from Marcellus Shale gas wells. Ethane, another component of natural gas, averaged 23 times higher for homes within a kilometer from natural gas wells. The excavator raised its boom and swung it toward the side of the garage. It came to an abrupt stop just before impact. The operator then raised the talons of the bucket to the top of the garage, and guided them in a slow arch, peeling back a swath of roof. The machine began biting into the asphalt tiles, roof boards and rafters. Within an hour, the two-car garage was mostly gone, and the machine continued chewing apart the house and packing wads of siding, insulation, wiring and splintered timber into dumpsters. By the end of the next day, all traces of the house were gone, except the foundation, which was filled in shortly thereafter. Time will tell whether 1101 Carter Road remains an uninhabited part of Cabot’s oil patch. The company, meanwhile, is staking much of its future on the gas field in northern Pennsylvania. According to Richard Zeits, reporting for the financial website Seeking Alpha, Cabot officials anticipate at least 3,000 future drilling sites on several hundred thousand acres in Susquehanna County. Yet at the heart of this area, where it all began, the future of the nine-square mile no-drill zone remains awkwardly bound to its legacy of water issues. Note: This video of the demolition was taken by Vera Scroggins, an anti-fracking activist who lives in Susquehanna County. The water well is still there. The next door neighbor, Debbie Maye, bought the 3.6 acres for 4,000 ! below market value. The demolition removes all traces of the Sautners, symbol of resistance to the Industry and exposure of Industry abuses of the People. Click here to visit our fundraising page.